Slow Cooker Greek Rice with Red Bell Pepper, Feta, and Kalamata Olives is an easy-to-make and delicious side dish; use the Crock-Pot Casserole Crock Slow Cooker for this tasty dish, or use a large oval slow cooker if that’s what you have. I love summer when lots of dinners are just something easy cooked on the grill, and this Slow Cooker Greek Rice with Red Bell Pepper, Feta, and Kalamata Olives from Kalyn’s Kitchen is a perfect side dish for any kind of grilled meat. I recently updated this recipe to make it work in the Crock-Pot Casserole Crock Slow Cooker, and it was definitely a hit. The new casserole crock recipe makes 6-8 servings, but if that’s too much for you (or if you want to use a small oval slow cooker like I did the first time I made this), there’s a link in the recipe post to the original version that makes 4-6 servings as well. Cooking rice in the slow cooker is a great way to get a nice side dish for something on the grill without heating up the house, but this tasty Slow Cooker Greek Rice is a great side dish any time of year..
Get the complete recipe for Slow Cooker Greek Rice with Red Bell Pepper, Feta, and Kalamata Olives from Kalyn’s Kitchen. The updated larger size of this recipe is perfect for the Crock-Pot Casserole Crock Slow Cooker or it could also be made in a 6 Quart Oval Slow Cooker. You can make the smaller size in a 3.5 Quart Oval Slow Cooker if you prefer. 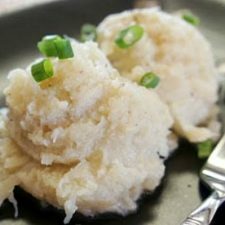 Click here to see all the Slow Cooker or Pressure Cooker Side Dish Recipes on this site! This is the recipe that gave me the courage to try making rice in the slow cooker! Lydia, so glad you tried it, and how I wish this recipe had a decent photo. I must make again soon. Kalyn, I would love to make this recipe but you did not include amounts of the ingredients. Is it possible that you could include this? After you raved about the casserole slow cooker I bought one on amazon. I haven't used it much yet but would really like to try this recipe. On this site we feature recipes from blogs all over the web, but you have to click the link where it says "Get The Complete Recipe for Slow Cooker Greek Rice with Red Bell Pepper, Feta, and Kalamata Olives" to get the actual recipe. That will take you to the original blog where the full recipe is posted. I hope you enjoy the casserole crock slow cooker; I really love mine!